Join the Collaborative for TAY Mental Health! 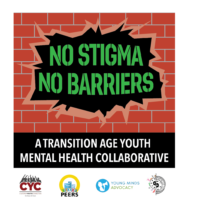 No Stigma No Barriers is a collaborative project, guided by transition age youth (TAY) 16–28, to end stigma towards mental health and break down barriers to care for young people in California. This project is funded by the Mental Health Services Oversight and Accountability Commission.